The Fellowship returns with the same fire of their younger wonder years, and with them they bring a humbleness achieved through longevity and proud success in the underground some 20 years since To Whom It May Concern. The crew made a promise years ago to never fall off. They remained true to their word by reuniting on this 14-track album that will take listeners back to the first time they heard these guys, but with a modern day vibe. 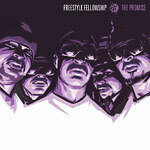 Myka9, PEACE, Self Jupiter and Aceyalone are joined on The Promise with the right production to elevate their always innovative deliveries by Omid, Kenny Segal, E. Super, Exile, Eligh, Black Milk and more!. Produced by Omid (tracks 1 & 3); Eligh (2); Exile (4); Kenny Segal (5 & 7); Myka 9 (6 & 12); E Super (8); Bionik (9); JMD (10); Black Milk (11); Biz One (13); Josef Leimberg (14).